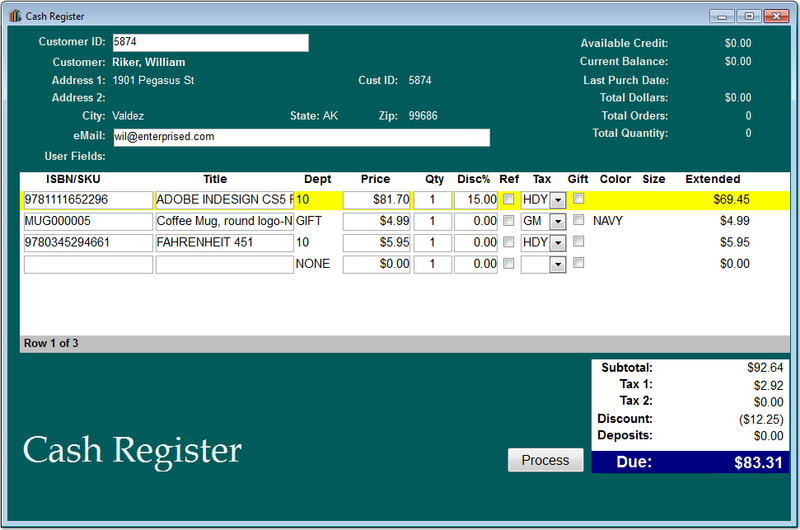 Booklog has long set the standard as a Point of Sale (POS) application that is easy to learn, use, and master. Booklog's sales interface operates like a conventional cash register, letting you ring up sales, open the cash drawer, and print sales receipts. Unlike a conventional cash register, it lets you lookup items by Title, ISBN, or Author. It also tracks customer sales, promotional club purchases, gift card sales and redemption, and more. What can you do with all of this customer information? Targeted marketing! You've got all the information at your fingertips - who bought mysteries, who prefers biographies, who hasn't been in the store for six months, and more. Inventory quantities are also updated after each transaction (sales or customer returns) and the end of day reporting includes a comprehensive overview of what was taken in and the performance of each department. Mail Orders – Use the Mail Order Module to ship inventory to customers, create a packing slip, and handle shipping/handling all in one window. Special Orders – Use the Special Order Module to take deposits, order specially requested items, and automatically email your customers when the item is received. Booklog will even notify your cashier that a customer’s order has been received when ringing up a regular transaction in the cash register! Remote Sales – The Remote Sales Module allows you to take Booklog with you to an offsite location. Create customized inventory lists, receipt information, and location specific reporting from wherever you are. Sales can be imported back into your primary database to keep track of inventory and remote sales transactions. Frequent Buyer Clubs – Use clubs to keep track of your incentive programs. You can create multiple clubs and for each one track member purchases, generate reports, and trigger rewards.